If you’re considering this upgrade, there are a few important things to decide before you start inviting everyone over for dinner al fresco, namely, your outdoor kitchen design. Consider the landscape and what you will be doing in the space. Whether you plan to add the kitchen to your outdoor oasis complete with fireplace and an in-ground pool or to your existing patio area, making sure the layout has the right flow is paramount to your design. 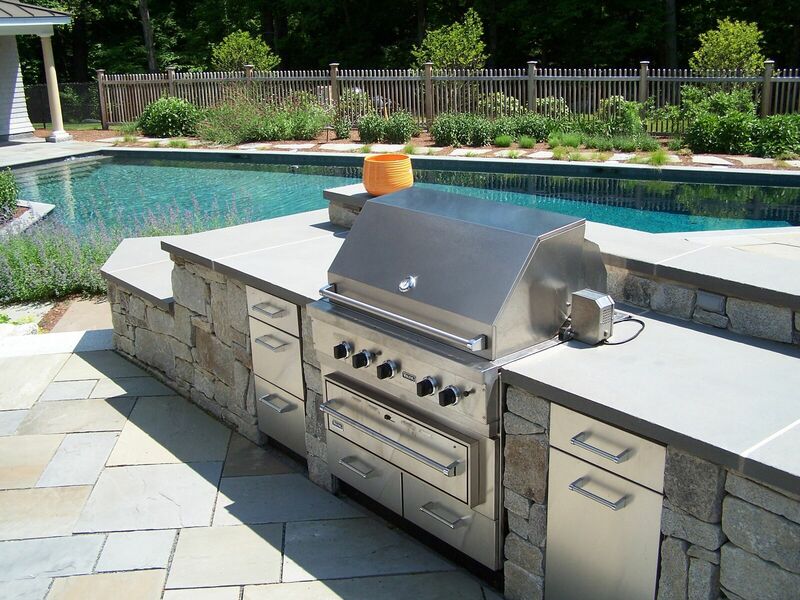 “Outdoor kitchens can have the simplest grill and countertop, all the way to a kegerator, brick pizza oven, commercial-grade kitchen appliance, full size refrigerators and specialized wine coolers, says Kris Holland, founder of Black River Landscape Management. Depending on what you choose, your outdoor kitchen will most likely fall into one of these three layouts: Modular (standalone pieces like a bar, sink or grill); Kitchen kits (premade outdoor kitchen islands with built-in grill and sink); or Custom built-in kitchens (larger landscapes that can feature modular pieces and add-ons like pergolas). 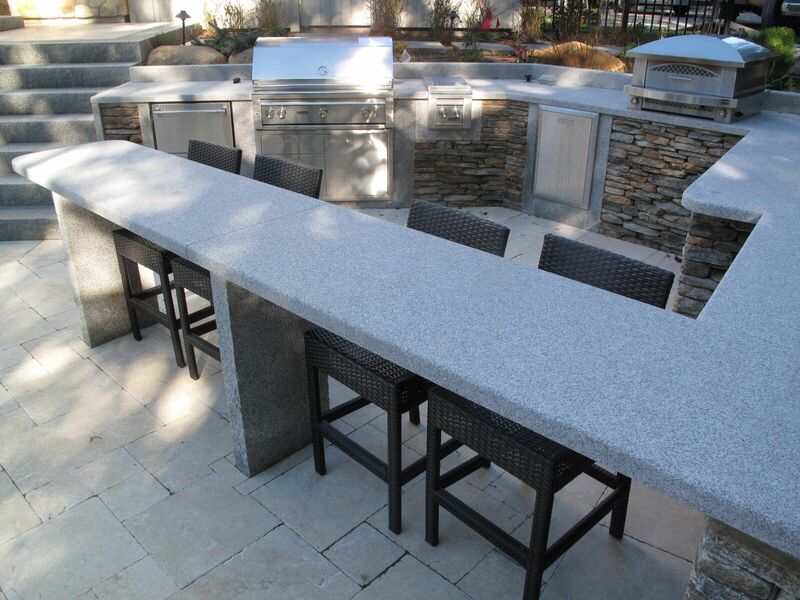 Natural stone and granite are durable, maintenance-free and naturally beautiful, making them ideal building materials for outdoor kitchen designs. At Swenson Granite Works, we will work with you to create a cohesive look and feel that’s unique to your home and bring your vision to life. While we are certainly here to help, one of the best ways to choose the right stone is just by taking a look around. 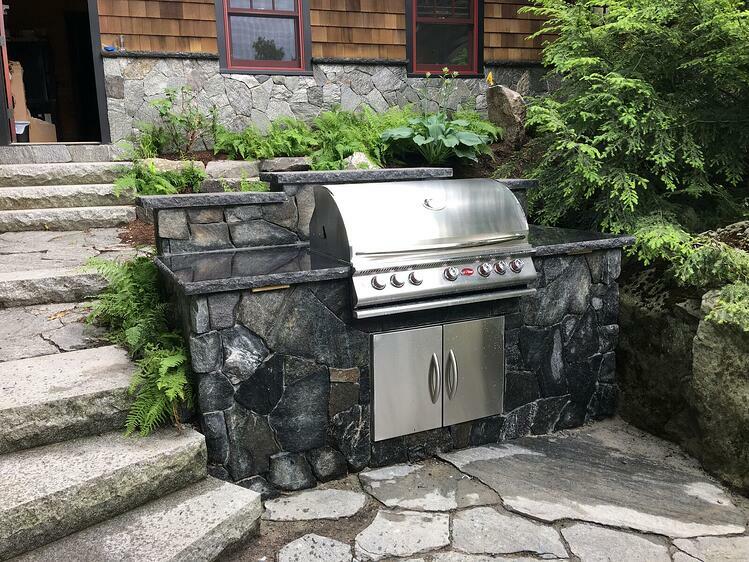 When you’re ready to add an outdoor kitchen to your backyard, visit a Swenson Granite Works retail store near you and we can help you choose the right stone veneer and countertops for your project. Allow your natural surroundings to inspire the design. Swenson Granite Works offer thin sawn veneers in granite, fieldstone and quartzite with natural or guillotine split front finishes. Patterns include mosaic, ledge, round, square and rectangular. 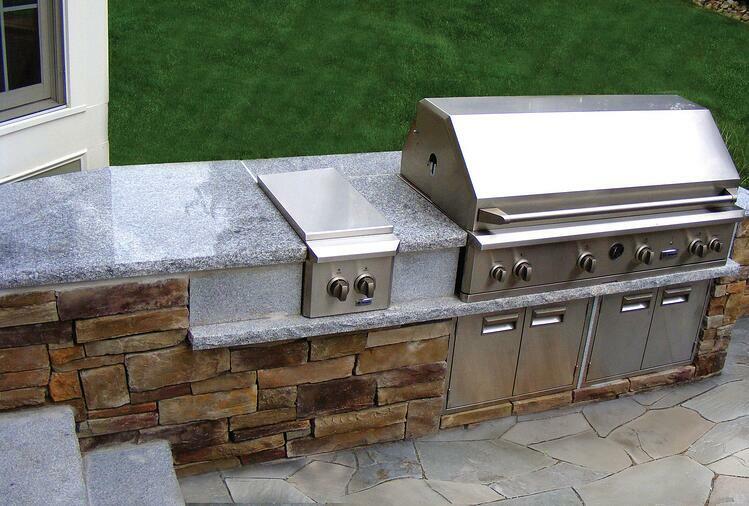 Granite and bluestone countertops add that solid finishing touch to your outdoor kitchen. These materials naturally prevent bacteria growth, unlike some other surfaces, and they weather beautifully. How will you be using this space? How often do you plan to use it? Go with stainless steel appliances for durability and easy cleaning. Make sure to include room for storage if you will be keeping pots, pans and other kitchen essentials outside. Is there enough seating closeby? Maintain that coveted sense of flow by keeping the chef and the guests all in one place. Don’t forget lighting! “It’s hard to see food cooking on a grill at night, so you need bright task lighting,” Russ Faulk says. You will also need enough light for dinner guests to see, too. Consider Swenson’s granite lamp posts and a pergola with string lights. DISCOVER OUTDOOR KITCHEN APPLIANCES IN OUR BACKYARD RETREAT WISHLIST. These outdoor kitchens created with natural stone and granite from Swenson Granite Works will give you some design inspiration. 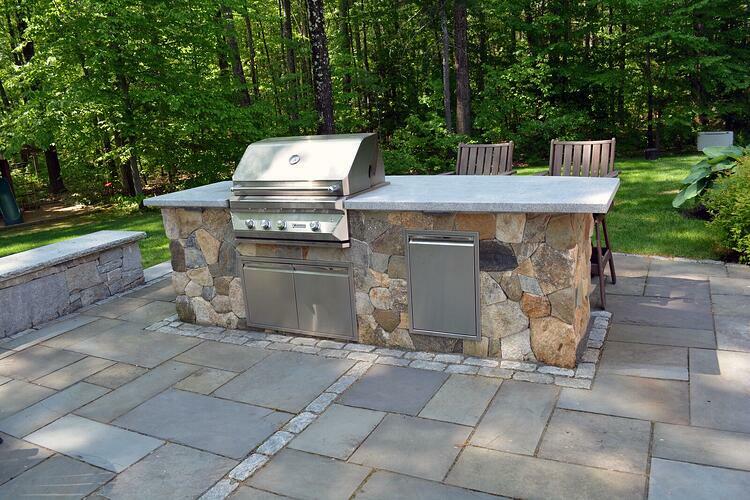 This New Hampshire poolside outdoor kitchen features Swenson Weathered Quarry veneer and a bluestone countertop. The patio pavers are full color bluestone. This sleek and streamlined Cambrian Black countertop and Black Mica stone veneer enhances the natural surroundings in a stylish Massachusetts home. 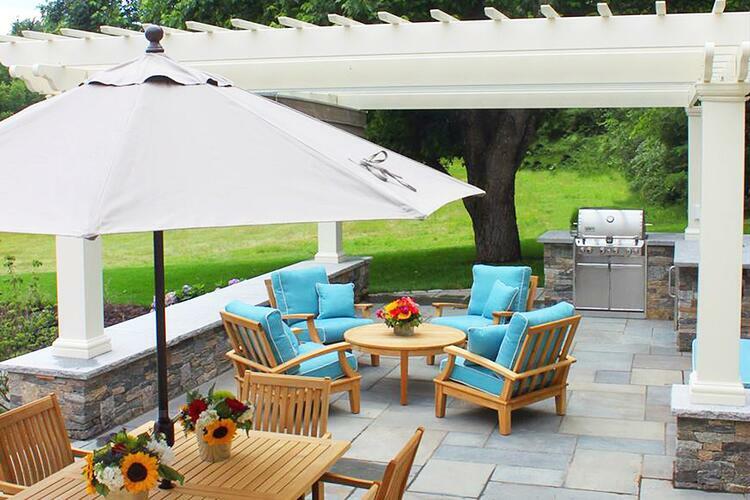 A sandblasted Woodbury Gray granite countertop and Connecticut Blend Ledge thin veneer add warmth and a natural aesthetic to this spacious Rhode Island backyard patio. The patio pavers are Woodbury Gray granite. A thin veneer of Boston blend mosaic brings character to this outdoor kitchen that is balanced by the honed Woodbury Gray granite on the grill and island in this New Hampshire outdoor oasis. To complete the look, the patio was decked out in a full color natural cleft bluestone with cobblestone edging. The walls and kitchen veneer in this dreamy New Hampshire home are crafted with Boston Blend Ledgestone thin veneer alongside walls caps and countertop in Woodbury Gray granite with rock face edges. 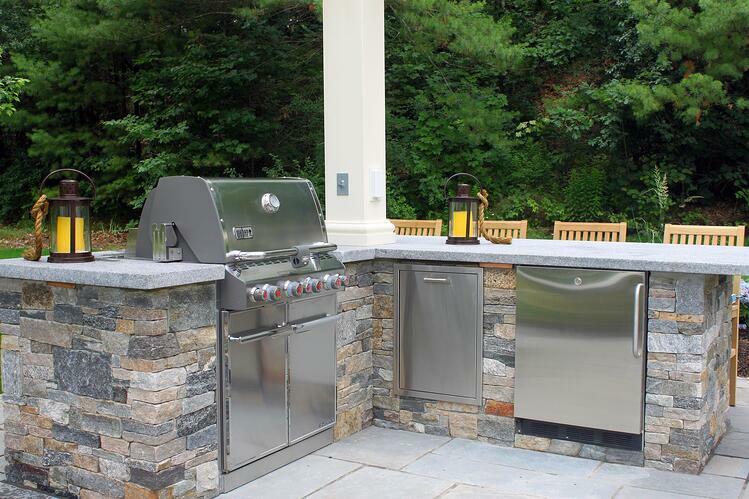 A compilation of natural stone and granite were used to create this outdoor kitchen. The countertop and facing are polished Woodbury Gray granite. The patio is constructed of irregular bluestone. Our thin veneer spec sheet will help you choose the right material for your outdoor kitchen. Download it here.